Stephen King's novel Revival is what I'd call a slow burn. Covering themes of family, addiction and faith, Revival spans 50 years in the life of Jamie Morton and his priest, Reverend Jacobs. Reverend Jacobs is obsessed with the power of electricity and he discovers he has the power to heal people. But does he heal with faith or science or is the whole thing just a con? "Her blond hair was underground now, growing brittle on a satin pillow in the dark." Oh my gosh, that still gives me the creeps! The best part of Revival was Jamie Morton's childhood growing up in New England. Stephen King has an unbeatable talent for writing young characters and the first quarter of the book had me chuckling and smiling, and the remainder of the book had me (and Jamie) yearning for the innocence of those early years. 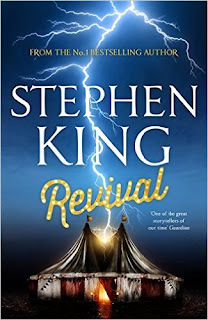 Promotional material claims Revival is a 'masterpiece from King, in the great American tradition of Frank Norris, Nathaniel Hawthorne, and Edgar Allan Poe' although I'd have to disagree. 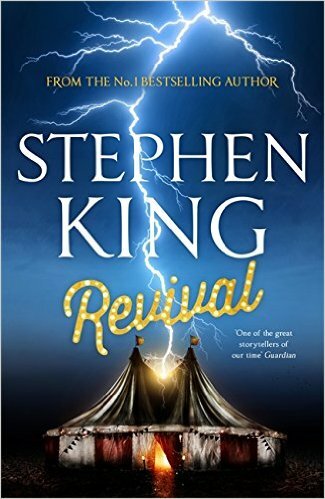 Revival was an enjoyable story and a great page turner with a few flashes of brilliant writing, but it wasn't a knock-out for me. This month it was announced that Revival has been adapted for the big screen by Josh Boone and is being reviewed by Universal Pictures, so let's hope we see it on the big screen.